The 15th annual CB&I TRI-The Woodlands Triathlon is set for Saturday, May 12, 2018, beginning at 7 a.m. The CB&I TRI is a USA Triathlon (USAT) sanctioned event, featuring a field of 1,300 participants. To ensure runner and spectator safety for the 2018 CB&I TRI event, the Montgomery County Sheriff's Office will be responsible for closing and re-opening lanes on streets along the race route, and residents are advised to plan accordingly during the morning hours during the event. 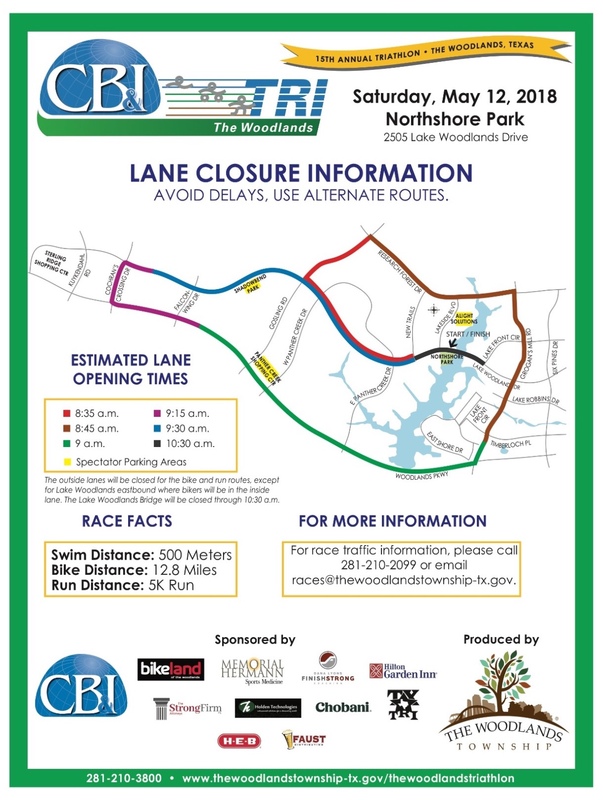 The inside lane of Lake Woodlands Drive - Eastbound from Cochran's Crossing to Windward Cove - will be closed to automobile traffic from 6 to 10:30 AM to accommodate racers. The outside lane of the following streets will be impacted by the race course between 6 to 10:30 AM. The following areas will be completely closed to automobile traffic from 6 to 10:30 AM to accommodate racers. Great minds think alike. I posted in the same minute that you did on this topic. Thanks for the post. Great event. Thanks for the post. I had forgotten and we are planning on taking my mom out tomorrow! We will make sure that we wait a bit before hitting the roads!